You may have heard it on Oprah, you may have heard it round the water cooler at work. It's all true. KFC is giving away a Grilled Chicken Two-Piece Meal Coupon. FREE. Kentucky Fried Chicken is only allowing downloads of the coupon from their microsite, unthinkfc.com through the end of today. That's right, today's the last chance we'll get to grab one of these coupons from the Colonel. The positive side, we can use the coupon from now (May 6) until May 19 (excluding Mother's Day, May 10, 2009). With the coupon, you'll get: two pieces of grilled chicken, two individual sides and a biscuit. For Free. Sweet deal! We here at Qmania enjoy spreading the word about awesome deals, discounts, coupons, and exclusive sales. Previous coverage of KFC here on the blog revolved around a 1 free piece of grilled chicken from KFC. We're still looking into whether this great deal from KFC may have been a response to El Pollo Loco's recent Free 2 Piece Meal. Either way, it's great to see such a widespread and memorable hookup from Kentucky Fried Chicken. Thanks again Colonel! the store did't accept the coupon....... They told me to mail the coupons somewhere. Kentucky Fried Chicken is only allowing downloads of the coupon from their microsite, unthinkfc.com through the end of today. 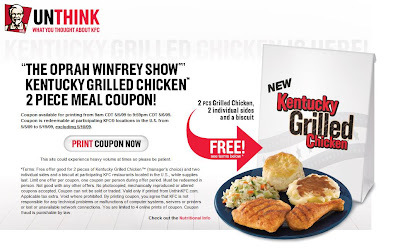 That's right, today's the last chance we'll get to grab one of these coupons from the Colonel.